a slender tube extending laterally from the uterus toward the ovary, one on each side, allowing passage of ova to the cavity of the uterus and of spermatozoa in the opposite direction. Called also uterine tube and oviduct. When the mature ovum leaves the ovary it enters the fringed opening of the fallopian tube, through which it travels slowly to the uterus. 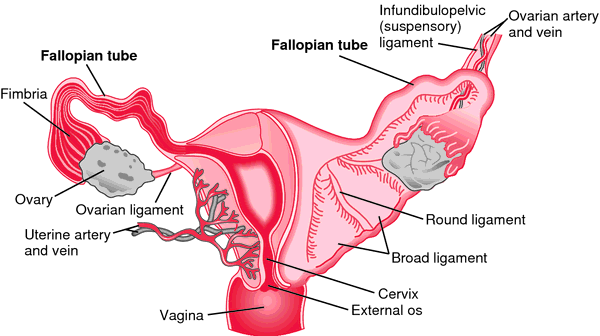 When conception takes place, the tube is usually the site of fertilization. Obstruction or infection within the fallopian tubes is a major cause of infertility. The removal of one tube by surgery, or the failure of a tube to function, ordinarily leaves the other tube intact and able to perform its function in reproduction. Occasionally the fertilized ovum implants in the wall of the fallopian tube, resulting in an ectopic, or tubal pregnancy. Fallopian tube. From McKinney et al., 2000. The mucosa of the fallopian tube. /en·do·sal·pinx/ (-sal´pinks) the mucous membrane lining the uterine tube. the mucous membrane lining the oviduct (uterine tube).